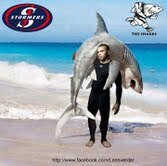 dSTORM is right there with the STORMers. My daughters are at the game. In need of rest ? Need peace and quiet ? Want to be where no-one else will be ? Then you need to go to Newlands on Saturday. My daughters came home with tears in their eyes (well not quiet but......), because the Stormers lost.